Nontuberculous mycobacteria (NTM) are emergent pathogens whose importance in human health has been gaining relevance after being recognized as etiological agents of opportunist infections in HIV patients. Currently, NTM are recognized as etiological agents of several respiratory and extra-respiratory infections of immune-competent individuals. The environmental nature of NTM together with the ability to assemble biofilms on different surfaces plays a key role on their pathogenesis. In the present work the ability of three fast-growing NTM (Mycobacterium smegmatis, Mycobacterium fortuitum and Mycobacterium chelonae) to persist within a model of human alveolar macrophages was evaluated. Most often human infections with NTM occur by contact with the environment. Biofilms can work as environmental reservoirs. For this reason, it was decided to evaluate the ability of NTM to assemble biofilms on different surfaces. Scanning electron microscopy was used to elucidate the biofilm structure. The ability to assemble biofilms was connected with the ability to spread on solid media known as sliding. Biofilm assembly and intracellular persistence seems to be ruled by different mechanisms. Nontuberculous mycobacteria (NTM) are a heterogeneous group composed of 169 different species of environmental organisms commonly isolated from water, soil, dust and diverse animals (http://www.bacterio.net/mycobacterium.html). For this reason, their isolation in clinical samples was regarded as contamination or colonization for a long time ,. Human infection with NTM became relevant with the emergence of the human acquired immune deficiency syndrome pandemic. Mycobacteria from Mycobacterium avium complex (MAC) were identified as the major cause of opportunistic infections in patients infected with the human immunodeficiency virus (HIV). In contrast to Mycobacterium tuberculosis, reporting of NTM infections is not mandatory; thus, precise incidence data are lacking. Despite this fact, NTM are recognized as etiological agents of healthcare-associated infections (HAIs), which are a major public health concern ,. These bacteria are often responsible for respiratory tract colonization/infection; infections related to medical procedures and disseminated infections in immunocompromised patients. Although M. avium remains the best-known NTM, rapidly growing bacteria, namely Mycobacterium fortuitum, Mycobacterium chelonae and Mycobacterium abscessus, are gaining growing relevance ,,. Biofilm formation is a successful survival strategy for these ubiquitous organisms found in the environment. Biofilm assembly proceeds through several phases, including reversible attachment, irreversible attachment, mature biofilm formation and dispersion. During this process, bacteria develop a matrix containing extracellular polymeric substances, such as polysaccharides, lipids and nucleic acids, to form a complex three-dimensional structure. NTM, organized in biofilms, are difficult to eradicate with common decontamination practices and are relatively resistant to standard disinfectants ,, such as chlorine, organomercurials, and alkaline glutaraldehydes ,,,. It is important to eradicate biofilms through agents that inhibit biofilm formation, using two main strategies: matrix synthesis and regulatory mechanisms . Biofilms can be also very resistant to high concentrations of antimicrobial drugs and are able to modulate the host immune system . This high resistance is mainly due to the virulence enhancing caused by biofilms. Bacteria within biofilm are more prone to horizontally exchange genes due to the maximum proximity between them . This gene transmission is a major cause for bacteria survival  and can account for a high frequency of mutations responsible for antimicrobial resistance . These mutations can trigger enzymatic production, modification of antibiotic target or formation of efflux pumps ,,. Bacteria can also switch their phenotypic stages causing a slower growth rate. This strategy will decrease, or even inhibit, the antibiotic efficiency of agents active on replicating microorganisms. The bacteria that adopt this behavior are called “persisters” . The depletion of nutrients in the center of the biofilm can also affect bacteria growth, having an impact on persisters . Bacteria cell-to-cell communication, known as quorum-sensing, involves the production of auto-inducer molecules (AIs) which mediate the behavior of the bacterial population . Many biological processes, e.g., biofilm formation or the expression of virulence factors, are controlled by quorum-sensing regulation . The self-produced matrix is also considered important in enhancing bacteria virulence. The matrix builds a barrier that can inactivate antibiotics, delaying or preventing antibiotic penetration within the biofilm and recognition of their targets . Many human diseases are caused or exacerbated by biofilms , and it is expected that as in other infectious diseases (e.g., urinary infections), biofilms provide an important reservoir for cells that can repopulate colonized sites upon removal of drug treatment ,. Nevertheless, the mechanism involved in biofilm assembly and persistence are far from being fully elucidated. Research on NTM biofilm is still in its infancy. The majority of the published studies were conducted on the model organism Mycobacterium smegmatis. It was shown that the genetic requirements for sliding motility on agar surfaces and biofilm formation are similar . The presence of specific cell wall components, such as glycopeptidolipids (GPL) , other factors such as GroEL1 , protein kinase , iron  or the lack of others, e.g., polyphosphate deficiency , affect biofilm formation, matrix composition and structure. The role played by cell wall GPL was also reported for Mycobacterium avium  and M. abscessus . Most of the studies in the biofilm field in general were focused on the identification of factors involved in the first phase of biofilm assembly (attachment to a surface). Protein adhesions required for irreversible surface adhesion have been identified, but there is little direct experimental support for these surface proteins mediating cell–surface interactions. The aims of this study are: to investigate the relationship between NTM biofilm assembly and intracellular persistence; and to characterize the ultra-structure of the biofilms assembled by the different NTMs enrolled in the present study. M. smegmatis mc2 155, M. fortuitum ATCC 6841 and M. chelonae ATCC 35752 were grown on Middlebrook 7H9 broth medium (Difco, Becton, Dickinson & Company, Sparks, MD, USA) supplemented with 10% OADC (v/v; Difco) and 0.05% Tween 80 (v/v; Sigma, St. Louis, MO, USA) until the exponential phase at 37 °C/5% CO2. At this point, single cell suspensions were prepared as described before  and stored at −80 °C in 50% glycerol (v/v; Sigma) solution in phosphate buffer saline (PBS) until further use. THP1 cells (ATCC TIB-202) were grown in RPMI 1640 (Lonza, Basel, Switzerland) supplemented with 10% fetal bovine serum (FBS; Lonza), 2 mM l-glutamine (Gibco, Life Technologies Corporation, Grand Island, NY, USA), 10 mM Hepes (Gibco), 1 mM sodium pyruvate (Gibco), 4500g/mL glucose (Gibco), and 50μ/mL gentamicin (Gibco) at 37 °C/5% CO2. The cells were seeded onto 96-well culture dishes at a density of 4×104 cells per well and treated for 72 h with 100 nM phorbol myristate acetate (Sigma). Then cells were washed three times with PBS and incubated for one more day in cell culture media without phorbol myristate acetate. Mycobacteria stocks were thawed and diluted in RPMI 1640 without gentamicin to an optical density (OD) at 600 nm of 0.1. Macrophages were then infected as described before . At infection time (1 h) and after several hours (4, 8, 24 h), infected macrophages were washed with PBS and lysed with an aqueous solution of 1% igepal (v/v; Sigma). Serial dilutions of the lysate were prepared in water and plated on Mueller-Hinton agar. After about 3 days of incubation at 37 °C, colony forming units (CFU) were counted. The assay was performed in triplicate using 96-well flat-bottomed cell culture plates (Nunc, New York, NY, USA) as described previously with small modifications . Briefly, NTM suspensions at a final concentration of 107CFU/mL were prepared in 0.9% sodium chloride from fresh cultures in Mueller-Hinton (MH) agar and tenfold diluted in MH broth (Oxoid, Basingstoke, UK). Two hundred microliters were distributed to each well using MH broth as a negative control. The plates were incubated at 37 °C to allow biofilm formation for different time periods. Then, the contents of each well were removed and each well was vigorously washed three times with sterile distilled water to remove non-adherent bacteria. The attached bacteria were stained for 15 min with 100 μL violet crystal at room temperature, washed with distilled water three times to remove excess dye and allowed to dry at room temperature. The violet crystal was dissolved in 100 μL of 95% ethanol (Merck, Darmstadt, Germany) and the optical density at 570 nm was read using a SpectraMax 340PC (Molecular Devices, Sunnyvale, CA, USA). Biofilms with different ages assembled either on the surface of a 6-wells cell culture plate (Nunc), on silicone disks, or on the interface between MH-broth and air were prepared as described previously by Bandeira and colleagues . Briefly, samples were fixed with 2.5% glutaraldehyde (EMS, Hatfield, PA, USA), 4% paraformaldehyde (Sigma) and 0.05% ruthenium red (Sigma) in 0.1M cacodylate buffer, pH 7.2, overnight, at 4 °C. This was followed by post-fixation in the dark with 1% osmium tetroxide (EMS), 0.05% ruthenium red for 2 h at room temperature and then washed twice with cacodylate and water, dehydrated, transferred to glass slides (BioMérieux, Marcy L’Etoile, France) and allowed to dry at room temperature. For backscattered electron analysis, samples were further embedded in Epon812 epoxy resin (EMS) and allowed to polymerize at 65 °C. Once polymerized, the blocks were trimmed and sectioned using an ultramicrotome (Leica, Solms, Germany). Thin sections were transferred to cover slips and contrasted as described before . Samples were mounted on the sample holder with carbon tape, sputter-coated with carbon (20 nm) using a Sputter Coater QISOT ES (Quorum Technologies, Laughton, UK), and were analyzed under an electron microscope JSM-7100F (JEOL, Tokyo, Japan). NTM strains were grown on M63 salts medium supplemented with 1 mM magnesium chloride (Sigma), 0.2% glucose (Difco), 0.5% casamino acids (Difco), 10μM ferrous chloride (Sigma) and a micronutrient solution. M63 medium was solidified with 0.17% agar (Difco). Twenty-five milliliters of sterile medium were dispensed per plate. Plates were allowed to remain at room temperature overnight and then were inoculated from colonies by poking with a toothpick. The plates were sealed with parafilm and incubated at 37 °C for 3 days. Bacterial spreading was then evaluated. Results of at least three independent experiments were expressed as the means ± standard deviation (SD). SEM micrographs were analyzed using ImageJ software being the statistical significance assessed by the Student t-test (two-tailed). A p value of <0.05 (*) or <0.01 (**) were considered to be statistically significant. The ability of NTM to persist within a model of human alveolar macrophages was evaluated. All strains were able to replicate at some extent within these cells ([Figure 1]). Until 8 h post-infection, all strains were able to replicate and afterwards only M. fortuitum followed this trend. 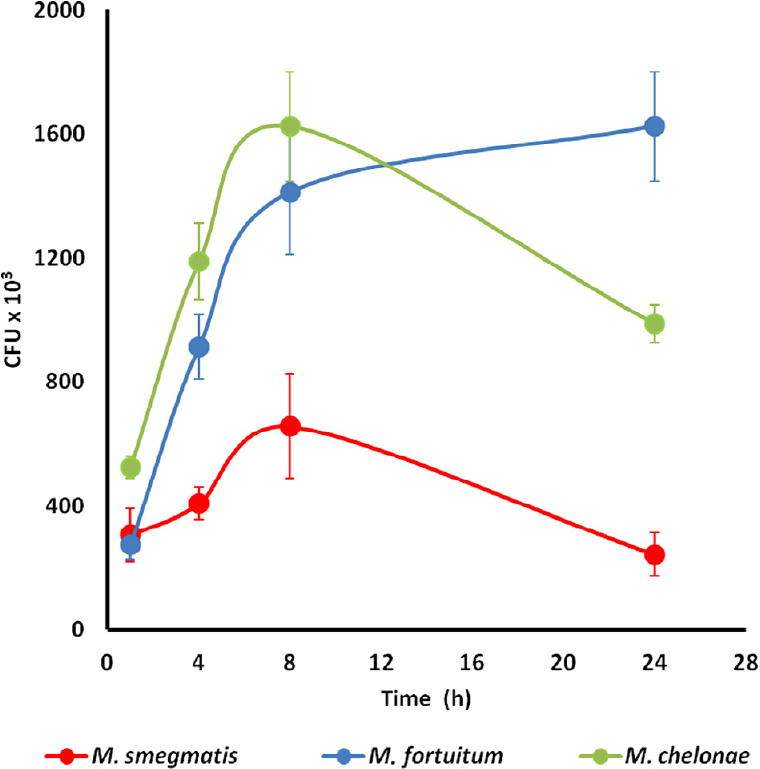 Although following different clearance kinetics, both M. smegmatis and M. chelonae started being killed by the macrophages. Macrophages were able to control M. smegmatis infection within 24 h, but not M. chelonae infection. For the last bacterium, the number of recovered CFU one day post-infection was higher than the initial inoculum. Figure 1: Intracellular fate of nontuberculous mycobacteria in a model of human alveolar macrophages. Colony forming units (CFU) for M. smegmatis (red), M. fortuitum (blue) and M. chelonae (green) were estimated after 1, 4, 8 and 24 h.
All strains of NTM were able to assemble biofilms on cell culture plates. The kinetics of biofilm assembly is shown in [Figure 2]. M. smegmatis and M. fortuitum are the best biofilm assemblers exhibiting similar increases on biomass over time. A representative SEM micrograph of a biofilm assembled by M. smegmatis is shown in [Figure 2]B. The details of a tower-like structure characteristic of a mature biofilm are also shown in [Figure 2]C. Biofilms of M. chelonae (worse biofilm assembler) were assembled following a distinct kinetic. This NTM has a longer adaptation phase leading to a slower biomass increase. Figure 2: Biofilm assembly by nontuberculous mycobacteria. The kinetics of biofilm assembly by M. smegmatis (red), M. fortuitum (blue) and M. chelonae (green) was followed over 5 days (A). A panoramic view of a M. smegmatis biofilm (B); and a detail of a tower-like structure (C); obtained by scanning electron microscopy are shown. Scale bars of 10 μm and 1 μm in (B) and (C), respectively. The difference between the biofilms assembled by the three strains of NTM on the cell culture surface did not reside only in the kinetic. 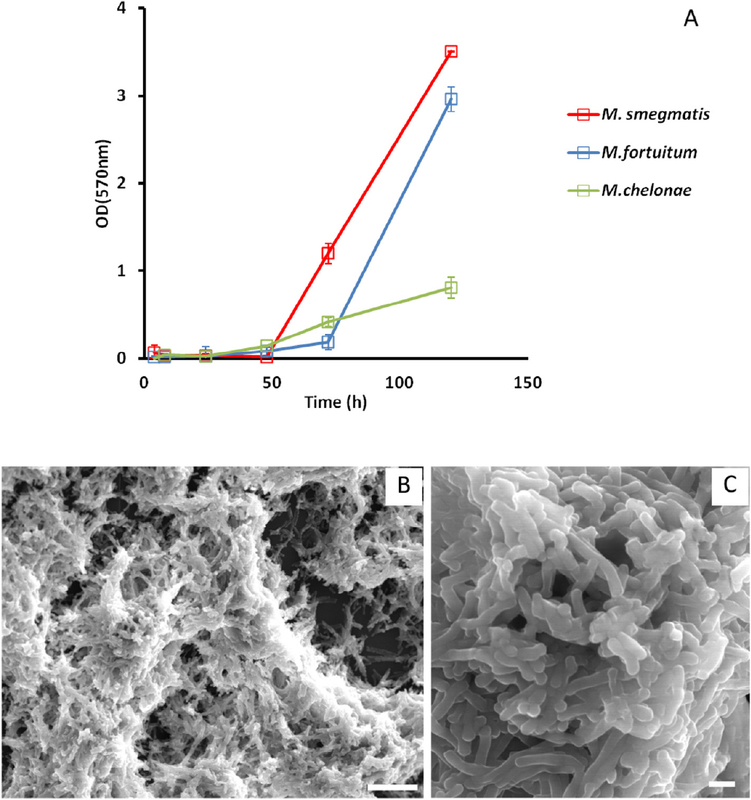 The SEM analysis of 3-day-old biofilms showed that M. fortuitum ([Figure 3]A) and M. smegmatis ([Figure 2]B and [Figure 2]C) secreted less extracellular matrix (EPS) than M. chelonae ([Figure 3]B and [Figure 3]C). The presence of EPS within M. chelonae biofilms is highlighted by arrows ([Figure 3]B) and arrow heads ([Figure 3]C). A more detailed analysis of NTM biofilms by SEM on EBSD mode showed that the difference between both bacteria and EPS relative areas in M. fortuitum and M. chelonae was significant ([Figure 3]D). The biofilms assembled by M. smegmatis were similar to those assembled by M. fortuitum and although it is different from M. chelonae, the difference was not significant. Figure 3: Comparison between biofilms assembled by different nontuberculous mycobacteria species. SEM micrographs of 3- day-old biofilms of M. fortuitum (A) and M. chelonae (B) assembled on cell culture plates are shown. The presence of extracellular matrix (EPS) in M. chelonae biofilms is highlighted either by red arrows (B) or red arrow heads (C) in SEM micrographs obtained by secondary electron beam and backscattered electron beam mode, respectively. A scale bar of 1 lm was used in all figures. The relative areas occupied by bacteria and EPS within 3-day-old biofilmswere evaluated (D) (*p<0.05; **p<0.01). The ability of NTM to assemble biofilms on surfaces that could contribute to bacteria persistence and spread within healthcare units was then evaluated. Biofilms assembled on silicone, a material widely used to coat medical devices, and air/liquid interface were characterized. Bacteria relative areas were significantly higher for 3- and 5-day-old biofilms assembled by all NTM on air/liquid interface than on silicone ([Figure 4]A). These data show that biofilms assembled on the air–liquid interface are denser than biofilms assembled on solid–liquid interface. No significant difference was found between NTM relative areas for biofilms assembled on the same surface ([Figure 4]A). The EPS secretion followed the same trend observed for bacteria biomass being the relative areas higher on air/liquid interfaces than on silicone ([Figure 4]B). Nevertheless, in this case the differences were significant not only between the two conditions tested (silicone, air/liquid interface), but also between different bacteria. 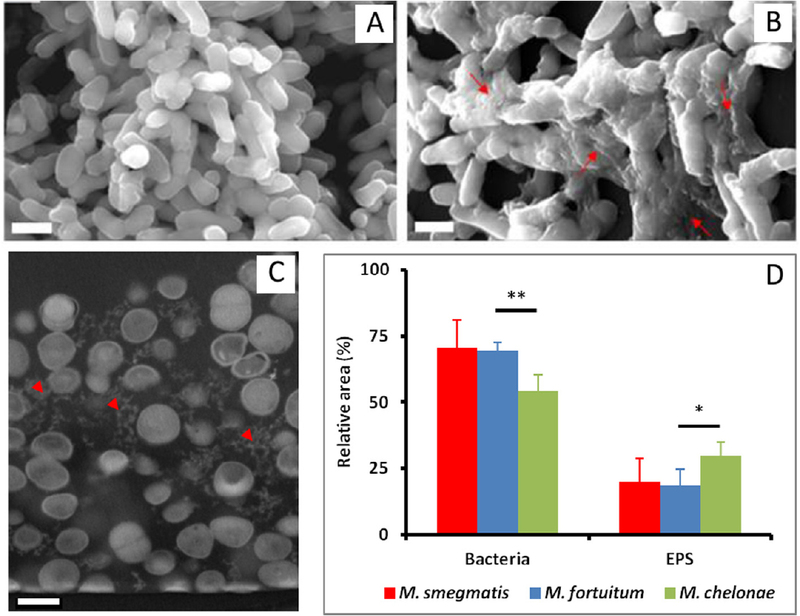 For 5-days-old biofilm, significant differences in the EPS relative areas occupied by M. fortuitum and the other 2 NTM within biofilms assembled on silicone were found. The same was observed between M. chelonae and the other 2 NTM for 5-day-old biofilms assembled on the air/liquid interface ([Figure 4]B). Although bacteria assemble distinct biofilms on different surfaces, the ranking of biofilm assemblers was kept unchanged. In all conditions tested, M. smegmatis and M. fortuitum were better biofilm assemblers than M. chelonae. Figure 4: Nontuberculous mycobacteria biofilms assembled on difference interfaces. Biofilms assembled by three NTM species on air–liquid and solid–liquid interfaces were characterized. The relative areas occupied by bacteria (A) and EPS (B) were determined (*p<0.05; **p<0.01). A good correlation was found between mycobacteria sliding and biofilm assembly. M. smegmatis and M. fortuitum spread on the surface of the semi-solid media generating centrifuge finger-like structures originated at the inoculation point. The maximum length achieved by these structures was of 34.5 and 27.5 mm for M. smegmatis and M. fortuitum, respectively. A different growth pattern was observed for M. chelonae; this bacterium grew around the inoculation point reaching a maximum diameter of 6.5 mm. The respiratory airways are a major target for mycobacteria infections . This study showed that even the model organism, M. smegmatis regarded as a saprophyte, has a limited ability to invade and replicate within human alveolar macrophages. M. fortuitum and M. chelonae, which are examples of rapidly growing NTM with increasing impact on human health, presented in good agreement with this fact higher intracellular replicating rates ([Figure 1]). The transmission of NTM infections between humans is highly unlikely. Most often human infection occurs by contact with environmental reservoirs of NTM present both in natural and humanized environments . The assembly of NTM biofilms on surfaces present in healthcare units could facilitate their persistence, human infection onset and spread. In order to explore this hypothesis, the ability of NTM to assemble biofilms on a model surface was studied ([Figure 2]A). All mycobacteria were able to assemble biofilms although following different kinetics. In this case and in opposition to other bacteria, Klebsiella pneumoniae, there is a relation between biofilm assembly kinetic and structure . Biofilms assembled by M. smegmatis and M. fortuitum have a higher content of bacteria than of EPS when compared with M. chelonae ([Figure 3]D). The exacerbated production of EPS by M. chelonae could be explained by the need of the worse biofilm assembler to promote bacteria attachment to the surface and between each other. The EPS amount is not uniform and may be altered in space and time, being proved that different bacteria produce it in different amounts . The amount of EPS within the biofilm varies over time, with the highest amount at attachment and dispersion phases ,. In order to further test the hypothesis that biofilms assembled in healthcare units could function as NTM reservoirs, the ability of these bacteria to assemble biofilms on silicone and air/liquid interface was assayed. Silicone was chosen because it is widely used as a coating material of medical devices, such as catheters and endoscopes, used in several procedures. The other interface was chosen based on previous reports that NTM assemble biofilms on water, namely in potable water systems also present in healthcare units. The ability of slow growing M. avium to assemble biofilms in water distribution systems and shower heads among other devices has been reported and can function as a source of human infection ,. All together these reports make this subject an interesting topic for study ,. Furthermore, it has been reported that the highest rate of NTM on water systems are related to hospitals . Biofilm assembled on air–liquid interface were analyzed by SEM under secondary electron beam mode. A detailed analysis of these samples showed that floating biofilms were denser and more compact than those assembled on silicone with the same age ([Figure 4]A and [Figure 4]B). The increase in thickness for biofilms assembled on air–liquid interface as already been described by others . On air–liquid interface bacteria are in contact with both gaseous and liquid phases having privileged access to all nutrients of both phases, e.g., oxygen . The biofilm assembled on air–liquid interface is very similar to a pellicle and has been reported that sliding motility is involved in its assembly . Sliding has been described as the ability to translocate on solid surfaces by a flagellum-independent spreading mechanism . This ability is generated by forces within the growing population, together with the properties of the growth surface. This movement results in less friction between cells and substrate, resulting in cell mobility. All the bacteria used in this study were able to move through sliding. Nevertheless, as observed before for biofilm assembly, M. smegmatis and M. fortuitum have a better performance generating bigger sliding halos than M. chelonae. This result is in good agreement with previous reports stating that the genetic requirements for sliding motility on agar surfaces and biofilm formation are similar . When comparing the intracellular persistence ([Figure 1]) and the kinetics of biofilm assembly ([Figure 2]A), it was realized that only M. fortuitum exhibits similar trends. In other words, this bacterium is able to survive within alveolar macrophages and is a good biofilm assembler. The best biofilm assembler is the bacterium more efficiently cleared by the macrophages (M. smegmatis); whereas M. chelonae, the worse biofilm assembler, has a better intracellular persistence than M. smegmatis. These data support the general notion that mycobacteria infections are a multifactorial process governed by a huge number of variables. Biofilms assembly may be one of these variables, but with others, such as mycobacteria virulence, lipidic composition could also play a role. This hypothesis is supported by the fact that the model organism is the best biofilm assembler and worst intracellular persister. Nevertheless, other studies must be performed in order to further elucidate the role played by biofilms on NTM pathogenesis, namely to identify the molecular mechanism governing not only biofilm assembly in vitro, but also in vivo. NTM are able to assemble biofilms on different interfaces. This ability could account for mycobacteria persistence and dissemination within healthcare units facilitating human infection. Biofilm assembly is related with mycobacteria sliding on agar plates. Nevertheless, a direct relation between NTM biofilm assembly and intracellular persistence within human alveolar macrophages was not found, suggesting that these two phenomena are ruled by different mechanisms. We thank Irene Matos (DDI, INSA) and Sergio Paulino (DSA, INSA) for technical support. I. Campbell, F. Drobniewski, V. Novelli, P. Ormerod, A. Pozniak, Management of opportunist mycobacterial infections: joint tuberculosis committee guidelines 1999, Thorax 55 (2000) 210–218. J.O. Falkinham 3rd, Epidemiology of infection by nontuberculous mycobacteria, Clin. Microbiol. Rev. 9 (1996) 177–215. ECDC Europe, Epidemiological Report 2012 – Reporting on 2010 Surveillance Data and 2011 Epidemic Intelligence Data, 2012. ECDC Europe, Surveillance of Surgical Site Infections in European Hospitals – HAISSI Protocol, 2012. M.S. Phillips, C.F. von Reyn, Nosocomial infections due to nontuberculous mycobacteria, Clin. Infect. Dis. 33 (2001) 1363–1374. M.A. De Groote, G. Huitt, Infections due to rapidly growing mycobacteria, Clin. Infect. Dis. 42 (2006) 1756–1763. W. Hoefsloot, J. van Ingen, C. Andrejak, K. Angeby, R. Bauriaud, P. Bemer, et al, The geographic diversity of nontuberculous mycobacteria isolated from pulmonary samples: a NTM–NET collaborative study, Eur. Respir. J. 42 (2013) 1604–1613. H. Koo, M.L. Falsetta, M.I. Klein, The exopolysaccharide matrix: a virulence determinant of cariogenic biofilm, J. Dent. Res. 92 (2013) 1065–1073. L.A. Carson, N.J. Petersen, M.S. Favero, S.M. Aguero, Growth characteristics of atypical mycobacteria in water and their comparative resistance to disinfectants, Appl. Environ. Microbiol. 36 (1978) 839–846. C. Le Dantec, J.P. Duguet, A. Montiel, N. Dumoutier, S. Dubrou, V. Vincent, Chlorine disinfection of atypical mycobacteria isolated from a water distribution system, Appl. Environ. Microbiol. 68 (2002) 1025–1032. S.B. Selvaraju, I.U.H. Khan, J.S. Yadav, Biocidal activity of formaldehyde and nonformaldehyde biocides toward Mycobacterium immunogenum and Pseudomonas fluorescens in pure and mixed suspensions in synthetic metalworking fluid and saline, Appl. Environ. Microbiol. 71 (2005) 542–546. J.D. Bryers, Medical biofilms, Biotechnol. Bioeng. 100 (2008) 1– 18. A. Casadevall, L.A. Pirofski, Virulence factors and their mechanisms of action: the view from a damage-response framework, J. Water Health 7 (2009) S2–S18. P.P. Halebeedu, G.S.V. Kumar, S. Gopal, Revamping the role of biofilm regulating operons in device-associated Staphylococci and Pseudomonas aeruginosa, Indian J. Med. Microbiol. 32 (2014) 112–123. D.I. Kisiela, S. Chattopadhyay, S.J. Libby, J.E. Karlinsey, F.C. Fang, V. Tchesnokova, et al, Evolution of Salmonella enterica virulence via point mutations in the fimbrial adhesion, PLoS Pathog. 8 (2012) e1002733–e1002749. A. Ito, A. Taniuchi, T. May, K. Kawata, S. Okabe, Increased antibiotic resistance of Escherichia coli in mature biofilms, Appl. Environ. Microbiol. 75 (2009) 4093–4100. N. Høiby, T. Bjarnsholt, M. Givskov, S. Molin, O. Ciofu, Antibiotic resistance of bacterial biofilms, Int. J. Antimicrob. Agents 35 (2010) 322–332. M. Wozniak, J. Tiuryn, L. Wong, An approach to identifying drug resistance associated mutations in bacterial strains, BMC Genomics 13 (2012) S23–S39. M. Kostakioti, M. Hadjifrangiskou, S.J. Hultgren, Bacterial biofilms: development, dispersal, and therapeutic strategies in the dawn of the postantibiotic era, Cold Spring Harbor Perspect. Med. 3 (2013) a010306–a010319. N. Barraud, A. Buson, W. Jarolimek, S.A. Rice, Mannitol enhances antibiotic sensitivity of persister bacteria in Pseudomonas aeruginosa biofilms, PLoS One 8 (2013) e84220– e84232. Q. Wei, L.Z. Ma, Biofilm matrix and its regulation in Pseudomonas aeruginosa, Int. J. Mol. Sci. 14 (2013) 20983–21005. S. Niveditha, S. Pramodhini, S. Umadevi, S. Kumar, S. Stephen, The isolation and the biofilm formation of uropathogens in the patients with catheter associated urinary tract infections (UTIs), J. Clin. Diagn. Res. 6 (2012) 1478–1482. A. Narciso, F. Nunes, T. Amores, L. Lito, J. Melo-Cristino, A. Duarte, Persistence of uropathogenic Escherichia coli strains in the host for long periods of time: relationship between phylogenetic groups and virulence factors, Eur. J. Clin. Microbiol. Infect. Dis. 31 (2012) 1211–1217. J. Recht, A. Martínez, S. Torello, R. Kolter, Genetic analysis of sliding motility in Mycobacterium smegmatis, J. Bacteriol. 182 (2000) 4348–4351. J. Recht, R. Kolter, Glycopeptidolipid acetylation affects sliding motility and biofilm formation in Mycobacterium smegmatis, J. Bacteriol. 183 (2001) 5718–5724. A. Ojha, M. Anand, A. Bhatt, L. Kremer, W.R. Jacobs Jr., G.F. Hatfull, GroEL1: a dedicated chaperone involved in mycolic acid biosynthesis during biofilm formation in mycobacteria, Cell 123 (2005) 861–873. R. Gopalaswamy, S. Narayanan, W.R. Jacobs Jr., Y. Av-Gay, Mycobacterium smegmatis biofilm formation and sliding motility are affected by the serine/threonine protein kinase PknF, FEMS Microbiol. Lett. 278 (2008) 121–127. A. Ojha, G.F. Hatfull, The role of iron in Mycobacterium smegmatis biofilm formation: the exochelin siderophore is essential in limiting iron conditions for biofilm formation but not for planktonic growth, Mol. Microbiol. 66 (2007) 468–483. T. Shi, T. Fu, J. Xie, Polyphosphate deficiency affects the sliding motility and biofilm formation of Mycobacterium smegmatis, Curr. Microbiol. 63 (2011) 470–476. R. Freeman, H. Geier, K.M. Weigel, J. Do, T.E. Ford, G.A. Cangelosi, Roles for cell wall glycopeptidolipid in surface adherence and planktonic dispersal of Mycobacterium avium, Appl. Environ. Microbiol. 72 (2006) 7554–7558. S.T. Howard, E. Rhoades, J. Recht, X. Pang, A. Alsup, R. Kolter, et al, Spontaneous reversion of Mycobacterium abscessus from a smooth to a rough morphotype is associated with reduced expression of glycopeptidolipid and reacquisition of an invasive phenotype, Microbiology 152 (2006) 1581–1590. L. Jordao, C.K. Bleck, L. Mayorga, G. Griffiths, E. Anes, On the killing of mycobacteria by macrophages, Cell. Microbiol. 10 (2008) 529–548. M. Bandeira, P.A. Carvalho, A. Duarte, L. Jordao, Exploring dangerous connections between Klebsiella pneumoniae biofilms and healthcare-associated infections, Pathogens 3 (2014) 720–731. E. Tortoli, Clinical manifestations of nontuberculous mycobacteria infections, Clin. Microbiol. Infect. 15 (2009) 906– 910. R.M. Donlan, Biofilms: microbial life on surfaces, Emerg. Infect. Dis. 8 (2002) 881–890. K.K. Jefferson, What drives bacteria to produce a biofilm?, FEMS Microbiol Lett. 236 (2004) 163–173. L.M. Feazel, L.K. Baumgartner, K.L. Peterson, D.N. Frank, J.K. Harris, N.R. Pace, Opportunistic pathogens enriched in showerhead biofilms, PNAS 106 (2009) 16393–16399. A.S. Bukh, P. Roslev, Mycobacterium avium complex in day care hot water systems, and persistence of live cells and DNA in hot water pipes, Curr. Microbiol. 68 (2014) 428–439. F. Portaels, Epidemiology of mycobacterial diseases, Clin. Dermatol. 13 (1995) 207–222. A.J. Spiers, J. Bohannon, S.M. Gehrig, P.B. Rainey, Biofilm formation at the air–liquid interface by the Pseudomonas fluorescens SBW25 wrinkly spreader requires an acetylated form of cellulose, Mol. Microbiol. 50 (1) (2003) 15–27. K. Scher, U. Romling, S. Yaron, Effect of heat, acidification, and chlorination on Salmonella enterica serovar typhimurium cells in a biofilm formed at the air–liquid interface, Appl. Environ. Microbiol. 71 (2005) 1163–1168. A. Martínez, S. Torello, R. Kolter, Sliding motility in mycobacteria, J. Bacteriol. 181 (1999) 7331–7338.